The Cabinet has agreed that local authorities will be reimbursed for any increased spending arising from the clean-up and repair operation after the recent bad weather. The Government has also identified road repairs as one of the top priorities following the worst weather to hit the country in decades. Humanitarian assistance will also be provided by the Department of Employment Affairs and Social Protection through local community welfare officers. The Department of Agriculture says funding is in place to deliver fodder to areas where it is in short supply. The Health Service Executive has said that home care provision has been affected as a result of the bad weather. Speaking at the National Emergency Coordination Centre, HSE executive Brendan Lawlor called for the public to continue checking in on elderly people in their area to ensure they have enough food, water and provisions. 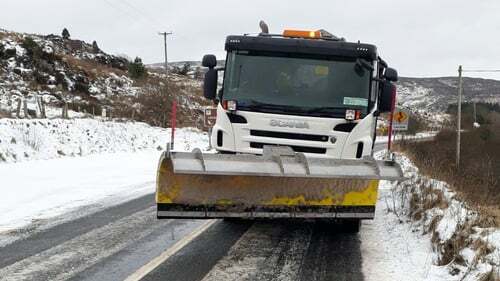 Mr Lawlor also said that HSE services in parts of Kildare, Wexford and Wicklow will recover more slowly than service provision in other areas of the country in the aftermath of the snow. He said the issue of delayed discharges continues to be a significant factor, but the HSE would try to facilitate those delayed discharges this week and he called for patience in relation to this. He reiterated yesterday's advice from the HSE that those whose hospital appointments have been cancelled as a result of the snow should not contact the HSE but rather wait until hospitals contact them. Around 40,000 hospital appointments were cancelled last Thursday and Friday as a result of the snow. There are 620 patients on wards and trolleys around the country waiting for admission to a hospital bed.